In Christianity, a minister is a person authorized by a church, or other religious organization, to perform functions such as teaching of beliefs; leading services such as weddings, baptisms or funerals; or otherwise providing spiritual guidance to the community. The term is taken from Latin minister ("servant", "attendant"), which itself was derived from minus ("less"). In the Catholic Church, Anglican, Oriental Orthodox, Nordic Lutheran, and Eastern Orthodox churches, the concept of a priesthood is emphasized. In other Christian denominations, such as the Baptist, Congregationalist, Methodist, Presbyterian and Reformed churches, the term "minister" usually refers to members of the ordained clergy who leads a congregation or participates in a role in a parachurch ministry; such a person may serve as a presbyter, pastor, preacher, bishop, chaplain or elder. With respect to ecclesiastical address, many ministers are styled as "The Reverend"; however, some use "Pastor" or "Father" as a title. Priests are called to be servants and shepherds among the people to whom they are sent. With their Bishop and fellow ministers, they are to proclaim the word of the Lord and to watch for the signs of God's new creation. They are to be messengers, watchmen and stewards of the Lord; they are to teach and to admonish, to feed and provide for his family, to search for his children in the wilderness of this world's temptations, and to guide them through its confusions, that they may be saved through Christ forever. Formed by the word, they are to call their hearers to repentance and to declare in Christ's name the absolution and forgiveness of their sins. With all God's people, they are to tell the story of God's love. They are to baptize new disciples in the name of the Father, and of the Son, and of the Holy Spirit, and to walk with them in the way of Christ, nurturing them in the faith. They are to unfold the Scriptures, to preach the word in season and out of season, and to declare the mighty acts of God. They are to preside at the Lord's table and lead his people in worship, offering with them a spiritual sacrifice of praise and thanksgiving. They are to bless the people in God's name. They are to resist evil, support the weak, defend the poor, and intercede for all in need. They are to minister to the sick and prepare the dying for their death. Guided by the Spirit, they are to discern and foster the gifts of all God's people, that the whole Church may be built up in unity and faith. Depending on the denomination the requirements for ministry vary. All denominations require that the minister has a sense of calling. In regards to training, denominations vary in their requirements, from those that emphasize natural gifts to those that also require advanced tertiary education qualifications, for example, from a seminary, theological college or university. This is a true saying, if a man desire the office of a bishop, he desireth a good work. A bishop then must be blameless, the husband of one wife, vigilant, sober, of good behaviour, given to hospitality, apt to teach; Not given to wine, no striker, not greedy of filthy lucre; but patient, not a brawler, not covetous; One that ruleth well his own house, having his children in subjection with all gravity; (For if a man know not how to rule his own house, how shall he take care of the church of God?) Not a novice, lest being lifted up with pride he fall into the condemnation of the devil. Moreover he must have a good report of them which are without; lest he fall into reproach and the snare of the devil. Likewise must the deacons be grave, not doubletongued, not given to much wine, not greedy of filthy lucre; Holding the mystery of the faith in a pure conscience. And let these also first be proved; then let them use the office of a deacon, being found blameless. Even so must their wives be grave, not slanderers, sober, faithful in all things. Let the deacons be the husbands of one wife, ruling their children and their own houses well. Bishops are the primary clergy, administering all sacraments and governing the church. Priests administer the sacraments and lead local congregations; they cannot ordain other clergy, however, nor consecrate buildings. In some denominations, deacons play a non-sacramental and assisting role in the liturgy. Francis of Assisi with the ecclesiastical tonsure. Francis was an ordained deacon. Gilbert White, Anglican priest and pioneering naturalist and ornithologist. Until the Reformation, the clergy were the first estate but were relegated to the secular estate in Protestant Northern Europe. After compulsory celibacy was abolished during the Reformation, the formation of a partly hereditary priestly class became possible, whereby wealth and clerical positions were frequently inheritable. Higher positioned clergy formed this clerical educated upper class. High Church Anglicanism and High Church Lutheranism tend to emphasise the role of the clergy in dispensing the Christian sacraments. The countries that were once a part of the Swedish Empire, i.e. Finland and the Baltics, have more markedly preserved Catholic traditions and introduced far less Reformed (that is, Calvinistic or Zwinglian) theology and hence the role of bishops, priests and deacons are notably more visible. Bishops, priests and deacons have traditionally officiated over of acts worship, reverence, rituals and ceremonies. Among these central traditions have been Baptism, Confirmation, Penance, Anointing of the Sick, Holy Orders, marriage, the Mass or the Divine Service, and coronations. These so-called "social rituals" have formed a part of human culture for tens of thousands of years. Anthropologists see social rituals as one of many cultural universals. The term rector (from the Latin word for ruler) or vicar may be used for priests in certain settings, especially in the Roman Catholic and Anglican traditions. In the Episcopal Church in the United States, a parish, which is responsible for its own finances, is overseen by a rector. A bishop is nominally in control of a financially assisted parish but delegates authority to a vicar (related to the prefix "vice" meaning substitute or deputy). The term "pastor" means "shepherd" and is used several times in the New Testament to refer to church workers. Many Protestants use the term as a prenominal title (e.g., Pastor Smith) or as a job title (like Senior Pastor or Worship Pastor). The English word clergy derives from the same root as clerk and can be traced to the Latin clericus which derives from the Greek word kleros meaning a "lot" or "portion" or "office". The term Clerk in Holy Orders is still the technical title for certain Christian clergy, and its usage is prevalent in canon caw. Holy Orders refer to any recipient of the Sacrament of Ordination, both the Major Orders (bishops, priests and deacons) and the now less known Minor Orders (Acolyte, Lector, Exorcist and Porter) who, save for certain reforms made at the Second Vatican Council in the Roman Catholic Church, were called clerics or Clerk, which is simply a shorter form of Cleric. Clerics were distinguished from the laity by having received, in a formal rite of introduction into the clerical state, the tonsure or corona (crown) which involved cutting hair from the top and side of the head leaving a circlet of hair which symbolised the Crown of Thorns worn by Christ at His crucifixion. Though Christian in origin, the term can be applied by analogy to functions in other religious traditions. For example, a rabbi can be referred to as being a clergy member. Parson is a similar term often applied to ordained priests or ministers. The word is a variant on the English word person from the Latin persona ("mask") used as a legal term for one having jurisdiction. The similar words "Dominie", "Dominee" and "Dom", all derived from the Latin domine (vocative case of Dominus "Lord, Master"), are used in related contexts. Dominie, derived directly from Dutch, is used in the United States, "Dominee", derived from Dutch via Afrikaans is used in South Africa as the title of a pastor of the Dutch Reformed Church. In Scottish English dominie is generally used to mean just schoolmaster. In various Romance languages, shortened forms of Dominus (Dom, Don) are commonly used for Catholic priests (sometimes also for lay notables as well) for example Benedictine Monks are titled Dom, as in the style Dom Knight. Dom or Dominus, as well as the English equivalent, Sir were often used as titles for priests in England up to the 17th century who held Bachelor of Arts degrees. Chaplain as in English or almoner (preferred in many other languages) or their equivalents refer to a minister who has another type of pastoral "target group" than a territorial parish congregation (or in addition to one), such as a military units, schools and hospitals. The Spanish word Padre ("father") is often informally used to address military chaplains, also in English and Portuguese (Brazil). Elders (in Greek, πρεσβυτερος [presbuteros]; see Presbyter) in Christianity are involved in the collective leadership of a local church or of a denomination. Some Presbyterian denominations call their ministers teaching elders. Ruling elders are ordained laymen who govern the church along with the teaching elders as the Church session. In the Assemblies of God and the Metropolitan Community Church Elders are the most senior leaders serving, leading, and supervising the worldwide denomination. In the Metropolitan Community Church an Elder can be a lay person or clergy. Such as men's ministry, women's ministry, youth ministry, kids ministry, singles and campus ministries, married couples ministry, because it gives each congregation member of different backgrounds and age groups to have a chance to fellowship with people in a closer life group to them. Lay people, volunteers, pastoral agents, community leaders are responsible to bring teaching the gospel in the forefront helping the clergy to evangelize people. Agents ramify in many ways to act and be in touch with the people in daily life and developing religious projects, socio-political and infrastructural. Jehovah's Witnesses consider every baptized Witness to be a "minister"; the religion permits any qualified baptized adult male to perform a baptism, funeral, or wedding. Typically, however, each such service is performed by an elder or a "ministerial servant" (that is, a deacon), one of the men appointed to "take the lead" in local congregations. Witnesses do not use "elder" or any other term as a title, and do not capitalize the term. They do not accept payment and are not salaried employees or considered "paid clergy". They support themselves financially. Appointments are made directly by Circuit Overseers under the authority of the local Branch, and Governing Body; appointment is said to be "by holy spirit" because "the qualifications [are] recorded in God's spirit-inspired Word" and because appointing committees "pray for holy spirit". In many evangelical churches a group (multiple elders as opposed to a single elder) of (non-staff) elders serve as the spiritual "shepherds" or caretakers of the congregation, usually giving spiritual direction to the pastoral staff, enforcing church discipline, etc. In some denominations these elders are called by other names, i.e. ; traditionally "Deacons" in many Baptist churches function as spiritual leaders. In some cases these elders are elected and serve fixed terms. In other cases they are not elected but rather they are "recognized by the congregation as those appointed by the Holy Spirit (Acts 20:28) and meeting the qualifications of 1 Timothy 3:1-7." Monsignor is an ecclesiastical title of honor bestowed on some priests. A prelate is a member of the clergy having a special canonical jurisdiction over a territory or a group of people. Usually, a prelate is a bishop. Prelate sometimes refers to the clergy of a state church with a formal hierarchy, and suggests that the prelate enjoys legal privileges and power as a result of clerical status. "Father" is a term of address for priests and deacons in some churches, especially the Roman Catholic, Orthodox and Anglican traditions. "Padre" (Spanish word for father, used in Brazil too) is frequently used in the military of English-speaking countries. A priest of the regular clergy. A pre-Scholastic Christian writer accepted by the church as an authoritative witness to its teaching and practice (see Fathers of the Church: those who were not completely orthodox but nonetheless had a major impact on Christianity, such as Origen and Tertullian, are called "ecclesiastical writers" instead). "Mama" is the local native language term for English speaking Anglican priests in the Anglican Church of Melanesia. It means "father" in several local languages in Vanuatu and the Solomon Islands. A bishop at the head of an ecclesiastical province or one of equivalent honorary rank. There are contrasting views on the level of compensation given to ministers relative to the religious community. There is often an expectation that they and their families will shun ostentation. However, there are situations where they are well rewarded for successfully attracting people to their religious community or enhancing the status or power of the community. The ordination of women has increasingly become accepted within many global religious faith groups, with some women now holding the most senior positions in these organizational hierarchies. There is disagreement between various global church denominations, and within membership of denominations, regarding whether women can be ministers. There was notable contention over the issue of ordination of practicing homosexuals in the 1980s within the United Church of Canada, and in the 1990s and early 21st century within the Presbyterian Church USA. The Episcopal Church, the American branch of the worldwide Anglican Communion, was as of 2016[update] divided over the issue of ordination of practising homosexuals. This conflict severely damaged relationships between Anglicans in North America and in the third world, especially Africa and southeast Asia, and has caused a schism in the American Anglican church. In the majority of churches, ordained ministers are styled "The Reverend". However, as stated above, some are styled "Pastor" and others do not use any religious style or form of address, and are addressed as any other person, e.g. as Mr, Ms, Miss, Mrs or by name. In Anglican churches the style for ordained ministers varies according to their office, as below. In all cases, the formal style should be followed by a Christian name or initial, e.g. the Reverend John Smith, or the Reverend J. Smith, but never just the Reverend Smith. These are formal styles. In normal speech (either addressing the clergy or referring to them) other forms of address are often used. For all clergy this may include the titles "Father" (male) or "Mother" (female), particularly in the Anglo-Catholic tradition, or simply the appropriate secular title (Mister, Doctor, etc.) for that person, particularly in the evangelical tradition; it is also increasingly common to dispense with formal addresses and titles in favour of verbal address simply by given name. Bishops may be addressed as "My Lord", and less formally as "Bishop". Similarly, archbishops may be addressed as "Your Grace", and less formally as "Archbishop". The titles "My Lord" and "Your Grace" refer to the places held by these prelates in the Church of England within the order of precedence of the state; however, the same titles are also extended to bishops and archbishops of other Anglican churches, outside England. 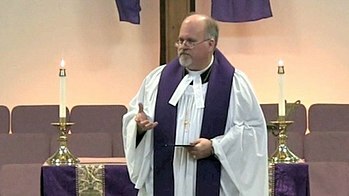 As Anglicanism represents a broad range of theological opinion, its presbyterate includes priests who consider themselves no different in any respect from those of the Roman Catholic Church, some parishes and dioceses in "Low Church" or Evangelical circles prefer to use the title presbyter or "minister" in order to distance themselves from the more sacrificial theological implications which they associate with the word "priest". While priest is the official term for a member of the presbyterate in every Anglican province worldwide, the ordination rite of certain provinces (including the Church of England) recognizes the breadth of opinion by adopting the title The Ordination of Priests (also called Presbyters). A priest is usually referred to as Father, and sometimes as Your Reverence or Reverend Father. A monsignor is addressed as "Monsignor." A bishop is addressed as Your Excellency or, less formally, Excellency. In Britain and some other countries they are formally addressed as My Lord or My Lord Bishop. An archbishop is also addressed as Your Excellency or, less formally, Excellency. In Britain and some other countries they are formally addressed as Your Grace. A cardinal is addressed as Your Eminence. The Pope of the Roman Catholic Church is often addressed as Holy Father or Your Holiness. In France, secular priests (diocesan priests) are addressed "Monsieur l'Abbé" or, if a parish priest, as "Monsieur le Curé". In Germany and Austria priests are addressed as "Hochwürden" (meaning "very worthy") or with their title of office (Herr Pfarrer, i.e. Mr. Parson). in Italy as "Don" followed by his name (e.g. "Don Luigi Perrone"). Religious priests (members of religious orders) are addressed "Father" in all countries (Père, Pater, Padre etc.). Up until the 19th century secular clergy in English-speaking countries were usually addressed as "Mister" (which was, in those days, a title reserved for gentleman, those outside the gentry being called by name and surname only), and only priests in religious orders were formally called "Father". In the early 19th century it became customary to call all priests "Father". In the Middle Ages, before the Reformation, secular priests were entitled as knights, with the prefix "Sir". See examples in Shakespeare's plays like Sir Christopher Urswick in Richard III. This is closer to the Italian and Spanish "Don" which derives from the Latin "Dominus" meaning "Lord;" in English, the prefix "Dom" is used for priests who are monks, a prefix which was spelled "Dan" in Middle English. The French "Monsieur" (like the German "Mein Herr", the Italian "Signor" and the Spanish "Señor") also signifies "My Lord", a title commonly used in times past for any person of rank, clerical or lay. The term "minister" is used by the Catholic Church in some cases, such as the head of the Franciscans being the Minister General. In the Greek-Catholic Church, all clergy are called "Father", including deacons, who are titled "Father Deacon", "Deacon Father", or simply "Father". Depending on the institution, seminarians may be titled "Brother", "Brother Seminarian", "Father Seminarian" or simply "Father". Their wives are usually addressed as "presvytera", "matushka" or "khourriyye" as in the Orthodox world and also by their first names. Greek-Catholic Patriarchs are addressed as Your Beatitude. Eastern clergy are usually addressed by their Christian or ordination name, not their surname. The form of address to the clergy of the Armenian Apostolic Church (belongs to the family of Oriental Orthodox Churches ) is almost the same. ^ Common Worship Ordination Services Paperback. Church House Publishing. 2007. pp. 123–. ISBN 978-0-7151-2131-3. ^ "Last Rites explanation". Beliefnet.com. 17 February 2011. Retrieved 3 September 2013. ^ "Applying the General Priesthood Principle", The Watchtower, February 1, 1964, page 86, "Among the witnesses of Jehovah any adult, dedicated and baptized male Christian who is qualified may serve in such ministerial capacities as giving public Bible discourses and funeral talks, performing marriages and presiding at the Lord's evening meal or supper. There is no clergy class." ^ "Jehovah's Sheep Need Tender Care", The Watchtower, January 15, 1996, page 15, "Christian elders are appointed by the Governing Body of Jehovah's Witnesses, and care is exercised not to use such terms as "pastor," "elder," or "teacher" as titles." ^ "Chapter 4: Why Respect Authority? ", "Keep Yourselves in God's Love", ©2008 Watch Tower, page 43, "Elders are appointed by holy spirit. (Acts 20:28) How so? In that such men must first meet the qualifications recorded in God's spirit-inspired Word. (1 Timothy 3:1-7, 12; Titus 1:5-9) Further, the elders who evaluate a brother's qualifications pray earnestly for the guidance of Jehovah's holy spirit." ^ Biblical Eldership, A.Strauch, Littleton, CO: Lewis & Roth, 1995. ^ See "How to address the Clergy" in Crockford Clerical Directory, including the online version. ^ Forms of clerical address outlined at Debretts Archived 2012-07-23 at Archive.today etiquette guide. Herbermann, Charles, ed. (1913). "Minister" . Catholic Encyclopedia. New York: Robert Appleton Company. ^ "Greetings & Salutations to Orthodox Clergy". Archived from the original on 2011-06-12. Retrieved 2008-11-28. ^ See Orthodox Churches (Oriental) Archived 2008-07-24 at the Wayback Machine and A List of Eastern and Oriental Orthodox WCC Member Churches. ^ See Catholicos of All Armenians. ^ See Catholicos of Cilicia. ^ See Biographical sketch of H. H. Aram I Keshishian, Catholicos of Cilicia Archived 2008-06-11 at the Wayback Machine. ^ There are two patriarchal sees in the [Armenian Apostolic Church] - the Armenian Patriarchate of Jerusalem and the Armenian Patriarchate of Constantinople.